Happy Presidents' Day! Maybe I should have put a cute little Uncle Sam hat on this guy or at least given him a flag, but I think he's cute enough as it is. On Saturday I posted that I intended to make bread and soup that afternoon. Well, somehow only the soup was made and I didn't make this bread until Sunday. 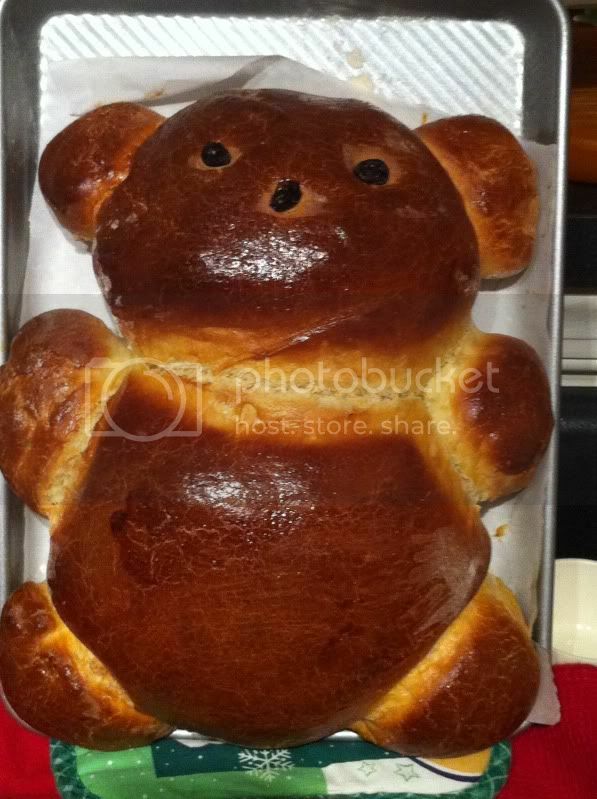 It was well worth the wait as he's both CUTE and yummy. Oh, and this way there might be a little left for my husband to try when he returns home from his trip. I found this recipe on Sweet Happy Life and basically only modified it to work with my breadmaker. Absolutely no muss or fuss with my breadmaker. I had originally intended to make two smaller bears with this recipe but I got a little impatient when putting him together that it seemed easier to make just one. Also in my impatience, I forgot to make a nose or belly button as shown in the original recipe. Goals for next time! If you have another method for adding ingredients to your breadmaker, go for it. Mine works best if all the wet ingredients are in the base of the pan, as to prevent the yeast from becoming activated too early I assume. 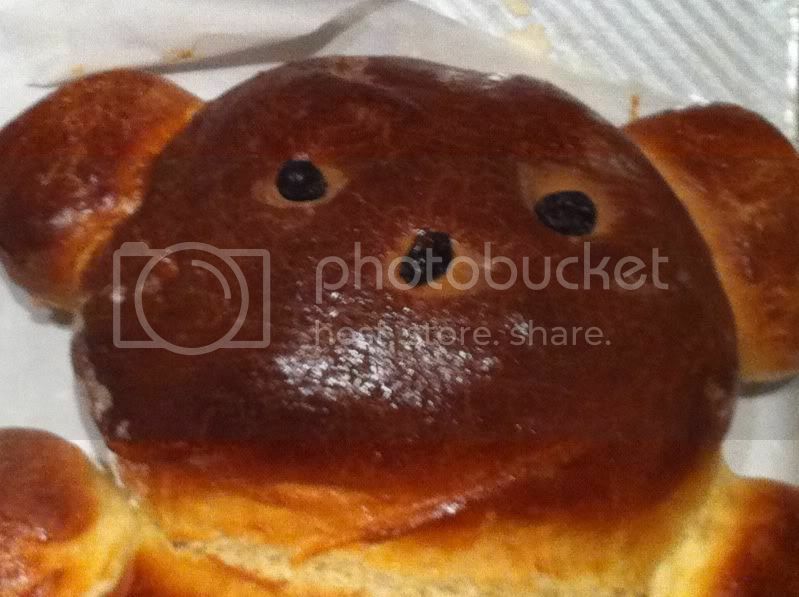 (I just know that if I put the honey on top, sometimes my loaves of bread have dimples which is only cute to a point ;). Since I use the preheating stage, I slightly beat my eggs into the milk mixture. Set machine to "dough" cycle and plan your bear design. Once the dough is ready, turn out onto a floured surface. Shape your bear. The original recipe recommends using 1/2 of the dough for the tummy, 1/4 of the dough for the head, and the other 1/4 for the hands, feet, ears, and nose. I kinda winged it (and forgot about the poor bear's nose). Cover bear loosely and let rise for 30 - 40 minutes, until almost doubled in size. Cut small slits for the bear's eyes, nose, and belly button and insert raisins or other dried fruit of choice. Whisk together egg and 1 tsp of olive oil and brush liberally over bear. 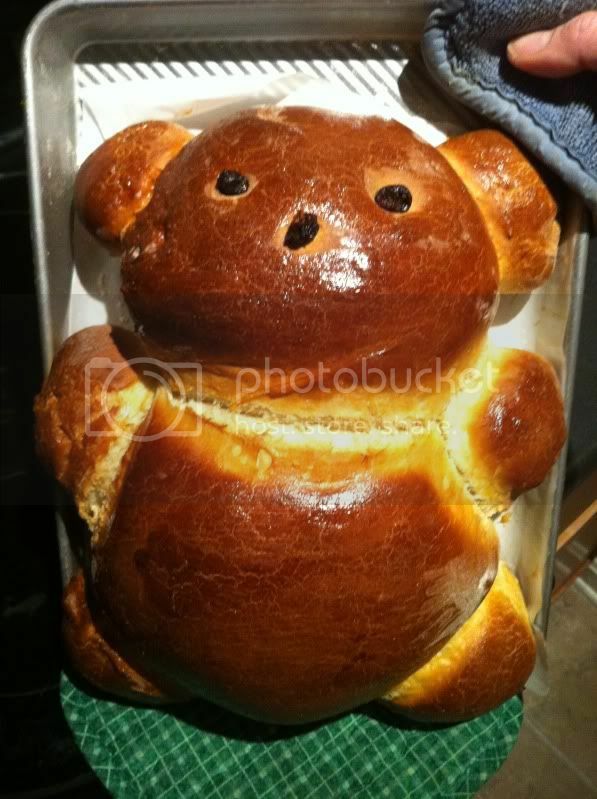 Bake for 30 minutes or until bear in golden brown and sounds hollow when thumped. Makes one loaf or large bear. Tags, Bags, Boxes and More 2 ! What's Cooking on This Bright and Sunny Day?